Christian Welzel (born 1964) is a German political scientist at the Leuphana University Lueneburg and Director of Research at the World Values Survey Association. Christian Welzel obtained his Magister Artium (M.A.) degree in Political Science and Economic History at the Saarland University in 1991 and continued with a doctorate at the University of Potsdam. For his monograph Democratic Elite Change: The Renewal of East German Elites from the Perspective of Democratic Sociology he was awarded a PhD with distinction in 1996. He worked as a Senior Research Fellow in the department of “Institutions and Social Change” of the Social Science Research Center Berlin and qualified as professor at the Free University of Berlin. 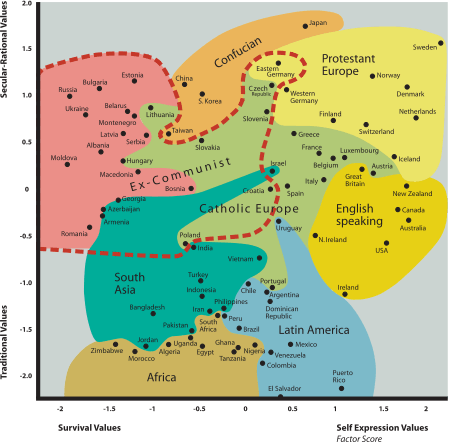 A recreation of the Inglehart–Welzel cultural map of the world, created by political scientists Ronald Inglehart and Christian Welzel based on the World Values Survey. Welzel, Christian (2002), Fluchtpunkt Humanentwicklung: Über die Grundlagen der Demokratie und die Ursachen ihrer Ausbreitung [Vantage Point ‘Human Development’: On the Roots of Democracy and the Causes of its Diffusion], Opladen: Westdeutscher Verlag, ISBN 3531136089 . Welzel, Christian (1997), Demokratischer Elitenwandel: Die Erneuerung der ostdeutschen Elite aus demokratie-soziologischer Sicht [Democratic Elite Change: The Renewal of East German Elites from the Perspective of Democratic Sociology], Opladen: Leske und Budrich, doi:10.1007/978-3-663-09587-3, ISBN 9783663095880 . Dalton, Russel J. & Welzel, Christian (2014), The Civic Culture Transformed. From Allegiant to Assertive Citizens, Cambridge: Cambridge University Press, ISBN 9781107039261 . Haerpfer, Christian; Bernhagen, Patrick; Inglehart, Ronald & Welzel, Christian (2009), Democratization, Oxford: Oxford University Press, ISBN 9780199233021 . Lauth, Hans-Joachim; Pickel, Gert & Welzel, Christian (2000), Demokratiemessung: Konzepte und Befunde im internationalen Vergleich [Measuring Democracy: Concepts and Findings], Opladen: Westdeutscher Verlag, doi:10.1007/978-3-322-89590-5, ISBN 9783531134383 . Alexander, Amy C.; Inglehart, Ronald; Welzel, Christian (2012), "Measuring Effective Democracy: A Defense", International Political Science Review, 33 (1): 41–62, doi:10.1177/0192512111414682 . Welzel, Christian; Deutsch, Franziska (2011), "Emancipative Values and Nonviolent Protest: The Importance of 'Ecological' Effects", British Journal of Political Science, 42 (2): 465–479, doi:10.1017/S0007123411000421 . Alexander, Amy C.; Welzel, Christian (2011), "Measuring Effective Democracy: The Human Empowerment Approach", Comparative Politics, 43 (3): 271–289, doi:10.5129/001041511795274931 . Alexander, Amy C.; Welzel, Christian (2011), "Islam and Patriarchy: How Robust is Muslim Support for Patriarchal Values? ", International Review of Sociology, 21 (2): 249–275, doi:10.1080/03906701.2011.581801 . Welzel, Christian; Inglehart, Ronald (2010), "Values, Agency, and Well-Being: A Human Development Model", Social Indicators Research, 97 (1): 43–63, doi:10.1007/s11205-009-9557-z . Welzel, Christian (2010), "How Selfish are Self-Expression Values? A Civicness Test", Journal of Cross Cultural Psychology, 41 (2): 152–174, doi:10.1177/0022022109354378 . Inglehart, Ronald; Welzel, Christian (2010), "Changing Mass Priorities: The Link between Modernization and Democracy", Perspectives on Politics, 8 (2): 551–567, doi:10.1017/S1537592710001258 . Brockmann, Hilke; Delhey, Jan; Welzel, Christian; Yuan, Hao (2009), "The China Puzzle: Falling Happiness in a Rising Economy", Journal of Happiness Studies, 10: 387–405, doi:10.1007/s10902-008-9095-4 . Inglehart, Ronald; Foa, Roberto; Peterson, Christopher; Welzel, Christian (2008), "Development, Freedom and Rising Happiness: A Global Perspective 1981-2006", Perspectives on Psychological Science, 3 (4): 264–285, doi:10.1111/j.1745-6924.2008.00078.x . Welzel, Christian; Inglehart, Ronald (2008), "Democratization as Human Empowerment", Journal of Democracy, 19 (1): 126–140, doi:10.1353/jod.2008.0009 . Welzel, Christian (2006), "Democratization as an Emancipative Process", European Journal of Political Research, 45 (6): 871–896, doi:10.1111/j.1475-6765.2006.00637.x . Welzel, Christian; Inglehart, Ronald; Deutsch, Franziska (2005), "Social Capital, Voluntary Associations, and Collective Action: Which Aspects of Social Capital Have the Greatest 'Civic' Payoff? ", Journal of Civil Society, 1 (2), doi:10.1080/17448680500337475 . Inglehart, Ronald; Welzel, Christian (2003), "Political Culture and Democracy: Analyzing Cross level Linkages", Comparative Politics, 36 (1): 61–79, doi:10.2307/4150160 . Inglehart, Ronald; Klingemann, Hans-Dieter; Welzel, Christian (2003), "The Theory of Human Development: A Cross-Cultural Analysis", European Journal of Political Research, 42 (3): 341–380, doi:10.1111/1475-6765.00086 . Inglehart, Ronald; Norris, Pippa; Welzel, Christian (2002), "Gender Equality and Democracy", Comparative Sociology, 1 (3-4): 235–264 .